Harkat Wohnzimmer Konzerts is a series of singer-songwriter sessions presented by Harkat Studios at their cozy Bungalow in Aram Nagar, Versova. A concert in our living room. And for a few hours this is YOUR living room. With a singer-songwriter right in front of you, strumming music only for you. 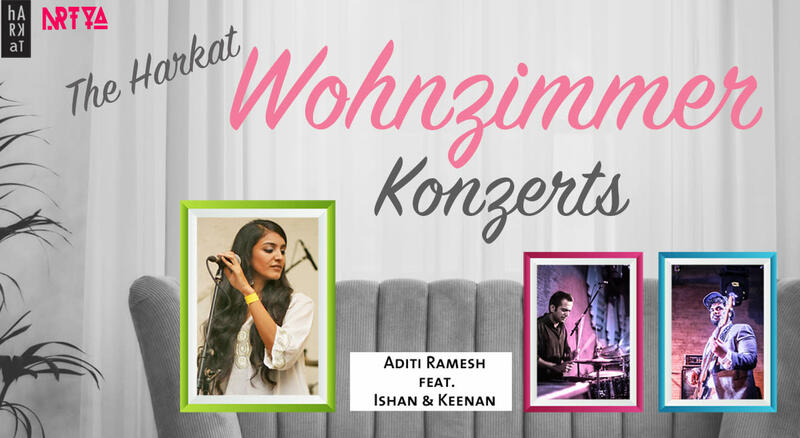 Now, in its 7th edition, the Wohnzimmerkonzert presents the spectacular Aditi Ramesh, featuring Ishan Jadwani on the Cahon and Keenan Thomas on the guitar. Aditi Ramesh is an exemplary vocalist, songwriter and producer with a herculean voice. She's deeply influenced by jazz, blues and traditional carnatic music. Her music takes on everyday topics and turns them into a thunderstorm of emotions, and at times into daydreamy tunes that urge the perspective of not taking oneself too seriously. It's funky, groovy, melodic and definitely living room concert material. Keenan Thomas aka Mr. Keenan is a Bassist & Producer from Mumbai. As a Producer, he makes music with Laminus & Tansane and as a Bassist, he has performed through his college and school years at various festivals and venues. After taking a 4 year hiatus from music, Keenan returned to study Music Production & Bass at Swarnabhoomi Academy of Music, and is now back in Mumbai to make the earth shake with his low end vibrations. Ishan Jadwani is a drummer who began playing the drums at the age of 4 and is currently based in Bombay. His passion for drums has had him play for several fusion and pop bands around Mumbai. Ishan teaches drums at Furtado’s School of Music.